Hungary's capital since 1873, Budapest, united the towns of Buda, Obuda and Pest, each with it's own Jewish community and history. Today, Budapest has one of Eastern Europe's largest Jewish communities with a population of 80,000. In medieval times, Jews lived in Buda as merchants, shopkeepers and craftsmen. A Jewish community formed in the late 11th-early 12th century. A synagogue was built in 1307, but was destroyed a number of years later. The Jews were expelled in 1348 and again in 1360, but were allowed to return shortly afterward. The Jewish community gained prominence in the late 14th and early 15th century. In 1446, wealthy Jews participated in the royal ceremonies of King Mattahias Corvinus. The King designated the head of the Jewish community in Buda as a spokesperson for the country's entire Jewish population. A second synagogue was built in Buda in 1461 and survived for many years. The situation for Jews took a turn for the worse in the 1490's, their property was confiscated and loans to Jews were not paid. For the fifteen years before the Ottoman conquest of Buda, a period of unrest ensued. The Ottoman victory against the Hungarians in 1526 led to a mass exodus of Jews to Western Hungary, others were deported to different areas in the Ottoman Empire. Two years later, Jews began resettling Buda once again. A period of tranquility for the Jewish community lasted until 1686. Jews were heavily taxed, yet their community continued to grow. Jews were active in commerce, finance and were tax collectors for the Treasury. There were Sephardi and Ashkenazi congregations, in this period. In 1660, the Jews population numbered 1,000 and was the largest in Hungary. The Jews sided with the Turks during the Austrian reconquest in 1686, and only 500 Jews survived the Austrian siege; the Jewish quarter was ransacked and Torah scrolls were burned. Expulsions, violence and anti-Jewish legislation marked the Hapsburg's rule. From 1686-1689, Jews were not allowed to live in Buda. Jews began returning in 1689. In 1703, Buda was declared a free royal city and Jews were given protection from the royal family. In 1712, however, Jews were once again briefly expelled from Buda. In 1715, Charles III told the Burghers (local middle class population) to stop violence against the Jews and a short period of peace ensued. The Emperor exempted some Jews from the restrictions placed against them, leading to resentment and attacks against Jewish homes in 1720. Charles III still tried to protect the Jews. During the rule of Maria Theresa, conditions deteriorated for the Jews. She expelled the Jews from Buda in 1746. Her son’s (Joseph II) rule was marked by an improved situation for the Jews; he permitted Jews to reside in the city in 1783. In the 1830's, a Jewish elementary school opened and, in 1866, another synagogue was built. Buda became part of Budapest in 1873. Jews have been living in Obuda, "Old Buda," since the 15th century. The community dissipated after the Ottoman conquest in 1526 and was not reestablished until 1712. The Jews were given protection from Count Peter Zichy, whose private estate encompassed Obuda. Jews were given a charter in 1746, in return for an annual protection tax. By 1784, 109 Jewish families lived in Obuda. The first secular Jewish school in the Hungary opened in Obuda in 1784. Obuda’s synagogue was destroyed in 1817 and a new one was built in 1820. Jewish merchants and craftsmen thrived in Obuda. Jewish linen weavers and silversmiths were well known in the city. Obuda, was the only city in the Hapbsurg Empire where Jews were free to carry out certain trades. Jews lived in Pest as early as 1407; a large community was documented in 1507. Records reveal Jews lived in Pest throughout the 16th century. After the Austrian conquest in 1686, Jews were prohibited from living in the city, or even spending a night there in an emergency. In the mid-18th century, they were allowed to come to the market held every week, which was attended by the whole country. In 1783, Joseph II allowed Jews to settle in Pest. He enacted a special tax, the tolerance tax, which the Jews had to pay to the town. Restrictions were placed on the type of Jew who was allowed to resettle - only those living there before 1790 were allowed to settle permanently. These restrictions were repealed in 1840. Jewish commerce and trade grew and Jews began acquiring property and factories. Jews volunteered for the Hungarian Revolution in 1848 and the military stopped a mob attack against the Jewish quarter in April 1848. Jews also contributed financially to the revolution. The revolution was suppressed and the Jewish community had to pay a huge fine. Pest's first synagogue and burial plot were opened in 1787. Pest's first Jewish school was opened in 1814, followed by a Jewish girl's school in 1852 and a teacher's college in 1859. This period was a time of prosperity for the Jewish community of Budapest. The community grew and played a major role in the development of the capital and the industrial boom in the country. The Hapsburgs recognized their achievements and 350 Jewish families were given the title of nobility. During this period, Theodor Herzl and Max Nordau were born in Pest. A separate Orthodox community was established in 1871 and opened a school for boys in 1873. The Rabbinical seminary and a secondary school (gymnasium) were established in 1877. A second gymnasium opened in the fall of 1919 because of the rise of anti-Semitism. A Jewish hospital and other welfare institutions were opened in 1841 and an Orthodox Jewish hospital was established in 1920. During this period many institutions were founded including the Hungarian Jewish Crafts and Agricultural Union, Pest Jewish Women's club, two orphanages and an institute for the blind. Jews in Budapest became active in the arts. One of the famous sculptors was Ede Telcs (1872-1948). He was known for his portrait busts and public monuments. Following World War I, and before World War II, Budapest’s Jewish population reached its peak, despite problems of decreased birthrate and increased assimilation and conversion. Just under 45,000 Jews lived in Budapest in 1869, and by 1930, the figure was 204,371. Jewish community life was once again restricted during the early 1940's. Before World War II, there were 125 synagogues in Budapest. In 1941, about 184,000 Jews lived in Budapest. Another 62,000 were considered Jews according to anti-Jewish laws in effect, so the total Jewish population was 246,000. At the beginning of the war Hungary sided with Germany and, consequently, was not occupied until March 1944. More than 15,000 Jews from Budapest were killed in labor camps and deportations before the German occupation. After the occupation, Adolf Eichmann started a Budapest Jewish council and denied freedom of movement within the city for Jews and forced them to wear a yellow badge. A Jewish ghetto was formed in June 1944; a month later, 200,000 Jews were moved to 2,000 homes. Plans were made to deport these Jews in July and August. Meanwhile, the neutral states planned rescue actions for the Jews of Budapest. 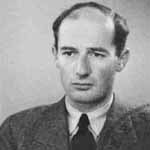 Raoul Wallenberg came to Budapest as secretary of the Swedish Foreign Ministry in July 1944 with instructions to save as many Jews as possible. He issued thousands of Swedish identity documents to Jews to protect them from Nazi deportation and is credited with ultimately saving as many as 100,000 people. He worked with the Swiss consul Charles Lutz, as well as Portuguese and Spanish legations to create "protected" houses and a "protected" ghetto to house the Jews with international identity papers. Wallenberg was last seen leaving the city on January 17, 1945, right after the Soviet army liberated the city. During the German occupation, the Hungarian fascist Arrow Cross Party came to power and carried out violent attacks against the Jews. They were shot and thrown into the Danube River. Tens of thousands of Jews died on death marches from Budapest to Austria. By the end of December 1944, 70,000 Jews lived in the central ghetto in Budapest and tens of thousands in the international ghetto or protected houses. The Hungarian government ceased to recognize international safe-conduct passes in January 1945. The Arrow Cross searched for Jews across the city and murdered them. The international ghetto was liberated by the Soviets on January 16, 1945, and the central ghetto two days later. About 94,000 Jews remained in the two ghettos at the time of liberation. Another 20,000 came out of hiding from the city, and another 20,000 returned from labor camps and labor service detachments. Nearly fifty percent of Budapest's Jewish population died during the Holocaust. Close to 80-90,000 Jews stayed in Budapest after the war and another 20-25,000 Jews left the city in 1956. By 1967, about 60-70,000 Jews lived in Budapest. Today, the figure is 80,000 and Budapest has the largest Jewish population in Eastern Europe. Young Jews, however, have not been active in communal life. Budapest’s Jewish population is about 80 percent Neolog (Reform and Conservative) and the rest are Orthodox. Budapest hosts the largest synagogue in Europe, located on Dohany Street. There are 26 active synagogues in Budapest. Three new Jewish schools, of varying religious outlook, have been established, along with two small yeshivot. The Rabbinical Seminary of Budapest (under the auspices of the Neolog community) has been expanded into a Jewish university, training teachers and social workers. Budapest’s Jewish community has a bi-weekly publication, Ul Elet and hosts a Jewish summer cultural festival. In mid-2004, more than a dozen buildings in the Jewish Quarter were sold to developers who planned to demolish them. A civic group appealed to the government to stop the destruction of the area where thousands of Jews were rounded up and held captive during World War II. Large numbers of Jews moved into the quarter in the second half of the 19th century, when they gained the right to buy property after centuries of discrimination. Approximately 200,000 Jews lived in the area before the war, which was also the birthplace of Theodor Herzl. In response to the protests, the government's Cultural Heritage Office was considering plans to halt construction work in the area until it completes a survey of which buildings should be saved. On April 16, 2005, Holocaust Memorial Day in Hungary, commemorating the date on which the ghettoization of Jews in the countryside began in 1944, Hungarian Prime Minister Ferenc Gyurcsany inaugurated a new memorial to Holocaust victims in Budapest. Sculptor Gyula Pauer’s work consists of 60 pairs of shoes cast in iron, a reference to the shoes of some of the thousands of victims shot into the river by the Arrow Cross. In October 2017, a memorial plaque was dedicated to Emil Wiesmeyer, whose printing company made 4,000 passports to help Raoul Wallenberg rescue Jews in Budapest. He subsequently produced another 20,000 to help Jews escape Hungary. The current Jewish life centers around the old Jewish community in Pest. Located in this district, one can find the major Hungarian and international Jewish communal organizations. There are several synagogues, the Orthodox mikvah, the Jewish Museum, a Holocaust Memorial, kosher restaurants, a kosher wine seller and three Jewish schools. This huge synagogue, built in 1859, seats 3,000 people and is the largest active synagogue in Europe and the second largest in the world (after Temple Israel in New York). The building was built in the the style of a basilica. The congregation practices Neolog Judaism. Its ark contains 25 torah scrolls taken from destroyed or looted temples during the Holocaust. 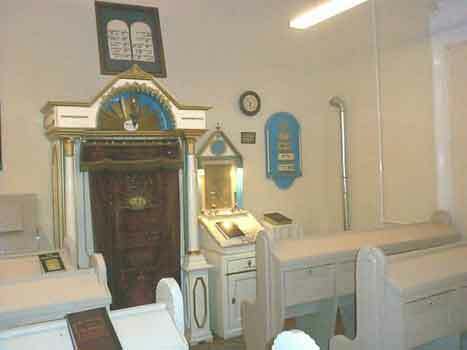 The synagogue also has an organ. During the Holocaust the shul was used as a concentration camp. Adolf Eichman had an office behind the rose window in the women's balcony, and the Germans used it as a radio tower. In the courtyard of the synagogue, there are mass graves of thousands of Jews from the ghettos in Budapest. A memorial, a weeping willow tree made of granite and steel commemorates all the Hungarian victims of the Holocaust. During the Communist period, many windows were broken and the Jews boarded up the synagogue. Pigeons managed to get in, however, and it became dark and smelly. Next to the synagogue there is a domed-building, Heroes Temple, built in 1929-31, in the same style as the synagogue. It is a memorial to the Jewish soldiers who died in World War I. The remains of this 15th century synagogue were found in the mid-1960's. The synagogue was restored in 1966 and beautiful frescoes and vaulting were uncovered. Currently it is part of the Jewish Museum. This synagogue was built in 1913 and is still in use today. Its courtyard, one of the best-preserved in Hungary, reveals its once vibrant community life. Next to the building is a kosher restaurant, Hannah. The Pesti Shul is a new modern Orthodox synagogue formed primarily by university students, university graduates, and young professionals. The small, intimate shul is located on Visegrádi street (XIII. Visegrádi u. 3), near the Western Railway Station, and welcomes visitors. With a Moorish style facade, this synagogue, built between 1869-1872, is a fine example of the work of the architect, Otto Wagner. Restoration on the synagogue began in 1990, due its poor condition. In September 2018, the synagogue was rededicated on Tancsics Street. Built in 1364, the Medieval Jewish Prayer House, a two-room Sephardic synagogue in the Castlewas taken from the Jews after a pogrom in 1686. It was forgotten until the 1960s when Jewish markings were found during a construction project. It later was used as a Jewish museum. In Obuda, there is a neoclassical synagogue built in the early 1820's. Today it is used by Hungarian Television, however, its facade still has a portico with the tablets of Moses and Hebrew inscription. Budapest's Rabbinical Seminary, opened since the early 1900's, was one of the few seminaries open during the Communist period. It houses a huge library of more than 150,000 priceless volumes of Jewish literature. The Jewish Museum is situated on the site of the house in which Theodor Herzl was born. It is only open between May and October because of heating problems in the winter. It houses thousands of documents and photos of Hungarian Jewish life, as well as Judaica and a section on the Holocaust. One of its interesting exhibits is a Jewish tombstone with an picture of a menorah etched on it, dating back to the 3rd century from the town of Esztergom. Hundreds of thousands of Jews are buried in this vast cemetery. One section contains a large Holocaust memorial wall with the names of thousands of Jews from Budapest who lost their lives in the Holocaust. A monument commemorating Raoul Wallenberg was dedicated in 1987. Another monument was dedicated in 1991 for Charles Lutz. Safe houses, where diplomats from Sweden, Switzerland and other neutral countries protected Jews are also open to the public.